Oh me too! We are on the same page ... I just posted about Paris today as well. I always go in Feb/March, so I often associate cold weather with Paris. I think I am the only freak that actually prefers Paris in the winter! I'm Loving Paris too. thats one of my wish list to visit.Nice blog you got here.If you have time it would be an honor if you can check my blog I am a new blogger.Ur such an inspiration. This makes me miss Paris so much...I've been itching to go back for some time now. So chic. I was just reading an old magazine featuring Paris and longing to go--this just cements it! he really does take some wonderful photos. i'm not so hip as to agree with the stylishness of a lot of the outfits (although i totally agree with you here) but i can appreciate the photography! Me too. I love the Sartorialist. Have you seen a french version -It is called une fille comme moi - which means a girl like me. 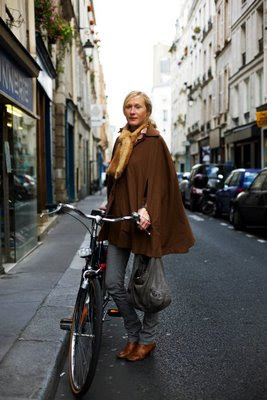 Paris and a bicycle -- say no more!! Must be something in the wine, perhaps?